“Stop my dog from digging!” was the cry on the other end of the phone. I heard the frustration in her voice. 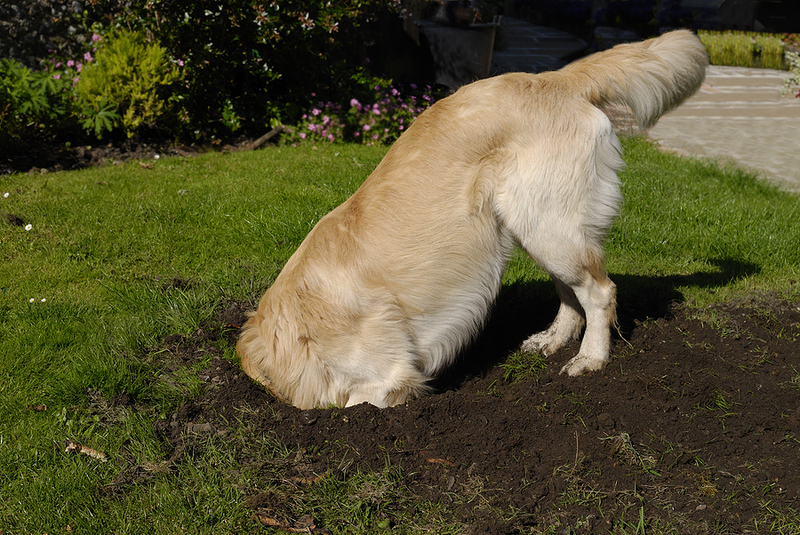 Are you as frustrated with your dog’s digging problem as this dog owner? Are you at your wits end? You are not alone. She answered, “All over the place! It’s got to stop immediately!” Well, “all over the place” didn’t give me enough information. I then asked her where he first began to dig and found out that he actually began to dig near the back door. As the digging persisted she began trying home remedies like putting poop and/or water in the holes to stop the digging but this just frustrated Digger and he began to dig elsewhere. My other question of, “When does Digger dig?” got this response: “When we’re not looking.” Don’t you find that is always the case with many dog behavior problems you’ve seen with your own dog? They always seem to “do it” when you’re not looking or gone from home. They’re not stupid. Apparently Digger was corrected when caught in the act and had learned the following: “it’s not safe to dig when my owners are looking. It’s safe to dig when they are not looking.” So Digger continued to dig, but only when the owners were gone or not looking. She further explained that Digger was now scratching – almost trying to eat his way through the door and back into the house. Sound familiar to you? I wanted to shed more light on Digger’s problem digging so I asked, “What did Digger do in the house that made you put him out in the yard in the first place? Apparently he jumped on house guests, sniffed them in inappropriate places and relentlessly licked them while they were sitting on the couch. Here’s what I heard: “He was so cute as a puppy, he’d tilt his head and give you that look and well, we figured he’d grow out of it” and so Digger, consequently, never got trained. Their solution was to put Digger in the back yard every time they had company. It solved one problem but created another. If your dog is digging in the backyard, perhaps frustrated at being put there in the first place, your solution is as simple as working on your dog’s in-house behavior. If every time Digger’s Mom has visitors, she puts him on a leash and begins to control Digger when visitors came over, he will quickly figure out what she wants – actually prefers – him to do. No jumping on visitors and settle down by my side while I’m talking to my friends – all acceptable and possible behaviors “if” Digger was on leash. A little dog obedience training goes a long way. Your dog just needs to know what it is that you expect of them. Here’s a simple, straightforward and easy-to-understand technique: Take control and train your dog on leash in the home. If you do not take control of your dog on leash and teach them how to behave, they will make up the rules on their own – and that’s where trouble begins. Digger was frustrated from being banished to the back yard from all social family activities. Tension built, Digger got frustrated and this frustration caused the digging problem. Bringing Digger back inside to work on the initial issues that banished him in the first place actually fixed a multitude of problems and everyone was much happier. Look for the root cause of your dog’s behavior, fix it and live happily ever after with your dog. Please commenton our blog and tell us what problems you’re having with your dog or how you liked this article.